Gridag is thankfully a privately bred dragon monster. Its powerful heated breath, strength and speed would quickly allow it to dominate almost any environment, rivaled in raw strength only by Tanukrook and Raptor, outside of titan class monsters such as Trove, Igrawn and other mythical unconfirmed beasts. 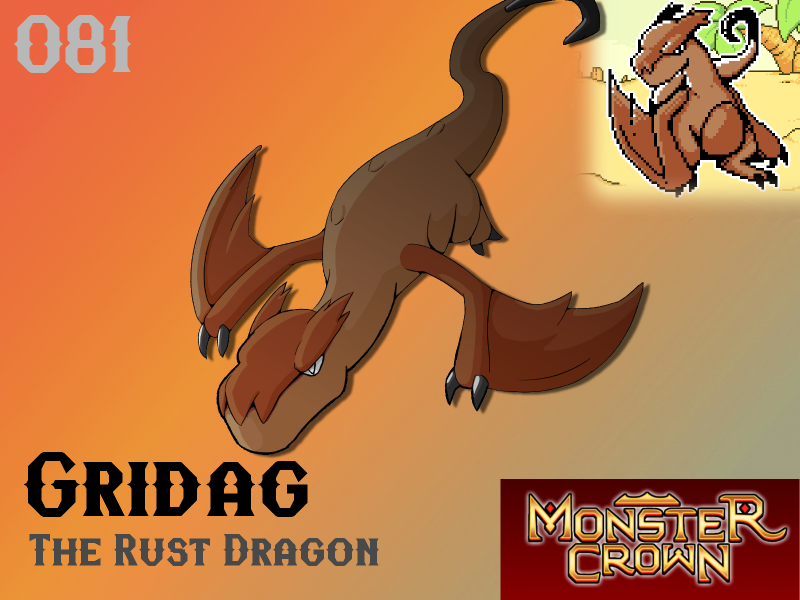 Despite common belief, Gridag does not breathe fire, but instead, blasts super-heated air peppered with burning metal embers. Flying close to the ground, Gridag will hook its hardened claws or tail into the ground to quickly change direction and corner enemies mid-flight. Thanks to these skills they excel in rocky, mountainous regions. Owning a Gridag is tough - their brash personalities demand a domineering tamer who is willing to return aggression without showing a hint of fear toward this beast. Poorly trained Gridag have been known to lose their temper and soar into the air, attacking the service Storklifts that serve Crown Island. Any tamer allowing such an incident to occur will forfeit their monster ownership rights for life, and receive a lengthy prison sentence. Will Gridag make your team? Definitely goin on the Team.